Using a sling, Linda D'eri, left, and Misty Niemeyer, members of an International Fund for Animal Welfare rescue team, carry one of 11 dolphins stranded ion a mud flat during low tide in Wellfleet, Mass., on Feb. 14. Ten of the dolphins were saved and one died. 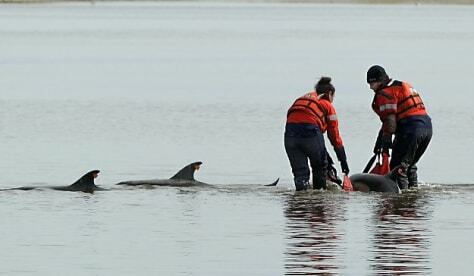 There have been 177 dolphins stranded in the area since Jan. 12.